Tonen Andrews O’Connor ’54 finds fulfillment as a Buddhist priest. In 1982, Sara Andrews O’Connor ’54 was managing director of the Milwaukee Repertory. She knew little about Buddhism, but that changed during a theater exchange trip to Japan that year. Spending time as a tourist in the ancient Zen temple of Sojiji on the Noto Peninsula and observing the practice of Buddhism for the first time proved to be a pivotal experience in her life. This May, O’Connor returned to Sojiji. This time, she came as resident Buddhist priest from the Milwaukee, [Wis.], Zen Center, bringing two novice Buddhists with her to expose them to the setting that had changed her life 28 years earlier. O’Connor says she stumbled into Buddhism without looking for it. “During college, I rejected the exclusivity of Christianity. Far from the small upstate New York town I came from, I discovered that there were millions of people who knew nothing about Christ. I thought they couldn’t all be bad,” she says. While studying French, she became acquainted with existentialism, the 20th-century philosophical movement embraced by French writers and thinkers such as Jean-Paul Sartre and Simone de Beauvoir that represented the rather pessimistic view that individual human beings themselves must create meaning in an unknowable, chaotic, and seemingly empty universe—a far cry from Catholicism and its strict commitment to spiritual tradition. “For a very long time, I lived with Christian ethics but an existentialist point of view,” O’Connor says. O’Connor began to practice Soto Zen Buddhism in 1986 under the teacher Tozen Akiyama. She took the precepts (the Buddhist code of ethics); was ordained as a priest in 1994; and received dharma transmission (the passing of teaching from master to pupil, establishing the pupil as a teacher in an unbroken spiritual “bloodline” of teachers ) in 1999. A few years ago, she officially changed her name from Sara to Tonen, the name that was given to her by her teacher. It includes a part of his name, in keeping with Buddhist tradition where lineage plays a significant role. 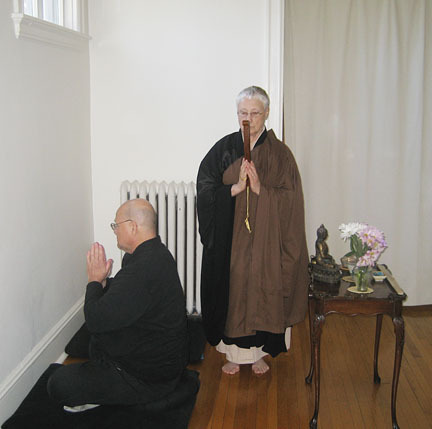 As resident priest at the Milwaukee Zen Center, O’Connor spends four days a week leading zazen, or meditation sessions. She devotes another day to administrative duties, sometimes with the help of a student who also lives there. Two days a week are devoted to off-site work, such as giving talks in high school religion classes, participating in panel discussions, and attending meetings as well as working with the inmates of five state prisons—a duty she’s enjoyed for the past 12 years. Working with small groups—or sanghas—of prisoners, O’Connor is collecting their experiences for a planned book. At the suggestion of one of the inmates, she publishes a quarterly newsletter called Sôsaku (literary creation), which is circulated through the prisons. The appeal of Buddhism to prison inmates, O’Connor believes, lies in the notion of impermanence. “Many people would see that as a negative, but for those men, most of whom are in for life, they’re stuck with their crimes. So when I tell them that one of the basic understandings of Buddhism is that you can and will change, they light up.” O’Connor offers them a route to a life inside the prison that is steadier and safer than the one that brought them there. She cites the inmate who proposed the newsletter as well as suggesting the book; a bilingual Puerto Rican who assists in the prison math class; one who is an interpreter for the prison psychiatrist; and another who is taking college courses. In keeping with the Buddhist idea of simple living, O’Connor uses no cosmetics or jewelry and possesses only work clothes and priestly robes for services. She receives money from Social Security and a small annuity from her former career, much of which she spends on the art and books that adorn her apartment on the second floor of the Center. When she retires in a couple of years, she’ll give many of her books away.